As many of you know by now, guitarist George Lynch is working on a very special project for his 30th Anniversary in Rock…a collection of 200 fine art canvases. This is your opportunity to see one and own one too. To reserve one of the total in the limited edition series, visit www.legacyoften.com and click on RESERVE YOUR PIECE on the left side. An exhibition representative will contact you shortly after. There will be 200 available in total of this Lynch fine art project. 100 are available to the public now, and numbers 100 through 200 will be exhibited at galleries exclusively in 2010. Each piece measures 40 inches by 30 inches. Though many are already reserved and/or sold…there are still some left within the series. 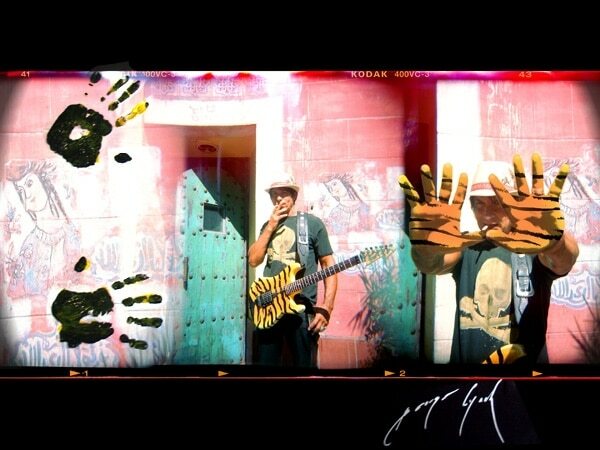 Each features the original handprints of the guitar legend on the canvas (each with a unique color and design approach from GL). The Lynch acrylic handprints are featured on top of the 30th Anniversary photograph shot by Evan B. Stone and printed on the canvas. This is an incredible piece of modern art and something every Lynch fan should see! For information about the series, feel free to contact Cory Danziger at SceneFour (213) 742-9862.